This week's prompt in Sally Russick's photo challenge at The Studio Sublime is The Beauty of Flowers. Oh great. I love flowers. And I like photographing flowers. But my personal take on the activity is to take a picture ( or pictures!) especially for the challenge. And well, it's WINTER. Soooo, green house? Florist shop? Silk flowers? I got to thinking about flowers as decor and I saw them... lots of places. I decided to focus on a lovely old dresser dish. I think the flower details here are very lovely. (Also the lace!) 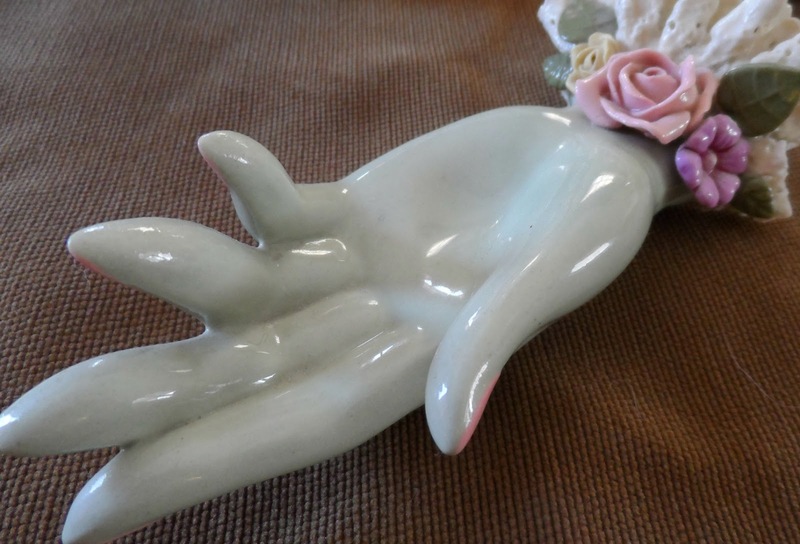 This is all china, a molded china hand, flowers, and lace. 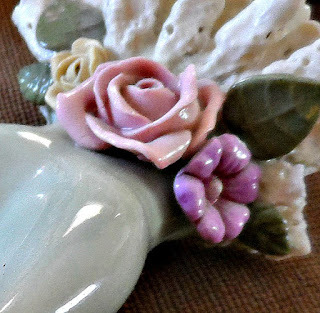 It makes a wonderful prop for taking pictures of other floral objects... in this case jewelry. The brooches are vintage pieces from yard sale-ing forays in the summer. The Lucite lily earrings are my own design. For more Flowery goodness visit Sally's blog. Beti, I love your take on the prompt and how you took time to find the beautiful photos that are already around you...wonderful finds! What a wonderful idea for this week! I love the china flowers! Love those china flowers and the vintage flowers are neat. great thought on flowers that are always around you. Sally never said they had to be live flowers. Love the flowers on the dresser dish. They are as pretty as the real thing. well, you did find flowers, and they are very beautiful, so well done you :) it's quite a challenge in the depths of winter!! Great idea to take pictures of these flowers. Love the vintage look! Great flowers! I love your vintage pins - love them! What a great interpretation of the prompt!!. Love those vintage pins and your jewelry. Great job finding flowers this time of year. Your hand is a wonderful jewelry prop. I adore vintage brooches - how divine! What a great idea to take photos of flowers that are decor or jewelry. And every bit as lovely as the real thing. 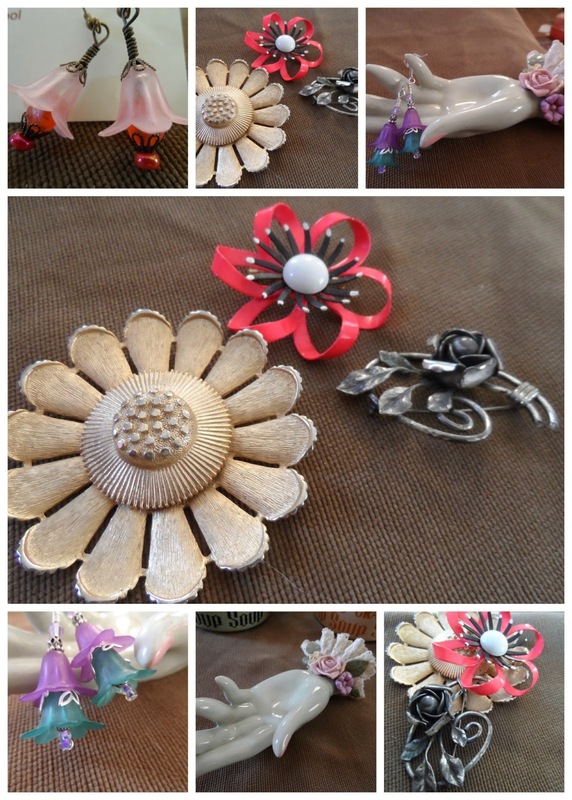 Oh, I'm really liking those vintage brooches! and your lucite earrings you created - super!! Love that your flowers are always with you and that they won't fade w/the season. I love this take on the challenge! I think you should be glad that I didn't come upon those treasures before you did. ; ) LOL! Flowers are a source of inspiration and beauty in so many ways. That's a very interesting and lovely china hand. I love that you thought outside the box and captured the flowers right there in your home. I bought this from a woman who was undoubtedly a grandmother. She was happy to see it go to a good home! Oh my goodness, Beti, that china piece is gorgeous!! Good flower hunting! This week was a challenge for me as well. Your china flowers are lovely and such a beautiful display. Love the china hand and what a great prop for photo shop. Hi Beti - How wonderful! Just love the piece and you are right - it's a terrific prop. I like the creativity of folks who are finding flowers of all types in the midst of winter. How beautiful! And creative as well. Flowers come in many forms, real and artificial. They all add a bit of sunshine to our lives.